BETTER EQUIPPED THAN MANY CARS TWICE ITS SIZE, THE FIAT 500 C SOON BECAME NICKNAMED ‘TOPOLINO’. THE NAME “TOPOLINO” TRANSLATES LITERALLY AS “LITTLE MOUSE” IN ITALIAN, BUT IS ALSO THE ITALIAN NAME FOR MICKEY MOUSE. THE 500C WAS AVAILABLE AS A TWO-DOOR COUPE AS WELL AS A COUPE WITH A FULL SUNROOF CALLED THE ‘CABRIOLET’ AND A THREE-DOOR STATION WAGON. THE FIRST WAGON, A 500B, WAS CALLED THE ‘GIARDINIERA’ AND WAS A TRADITIONAL WOODIE. IN 1951, IT WAS JOINED BY THE ALL-STEEL BELVEDERE. 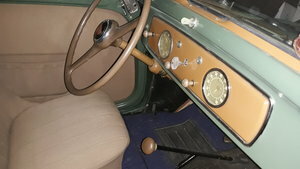 THE TOPOLINO HAS AN INDEPENDENT FRONT SUSPENSION, FOUR-SPEED TRANSMISSION WITH 3RD AND 4TH GEAR SYNCHROMESH AND HYDRAULIC BRAKES. TOP SPEED WAS IN THE NEIGHBOURHOOD OF 56 MPH. THIS TOPILINO BELVEDERE HAS A WONDERFUL STORY TO ITS NAME, 10 YEARS AGO ALBERTO VALSTRONA HAD JUST CELEBRATED HIS 75TH BIRTHDAY AND WANTED TO WORK AT A PROJECT WHICH PROVES HIS TECHNICAL SKILLS. WITH FANTASTIC MEMORIES DRIVING AROUND THE NEARBY LAKE D’ORTA IN A FIAT TOPILINO HE OWNED MANY YEARS PREVIOUS, HIS SEARCH BEGAN TO FIND A SUITABLE CAR TO RESTORE. 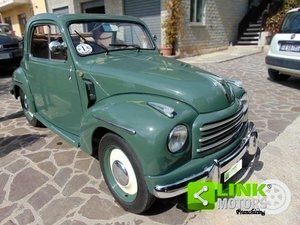 AFTER REJECTING SEVERAL, ALBERTO SOON FOUND THIS 1954 EXAMPLE, THE FIAT WAS SOLID, COMPLETE AND VERY ORIGINAL… IT WAS THE PERFECT STARTING POINT. THE PICTURES OF THE UNDER CARRIAGE SHOW THE RESTORER GAVE ALL DETAILS EXTRAORDINARY ATTENTION. AFTER MORE THAN TWO YEARS, THE CAR WAS READY AND ALBERTO WAS ABLE TO ENJOY THE ROADS OF LAKE D’ORTA ONCE MORE. HAVING RECEIVED A FULL BODY OFF RESTORATION, THE FILE CONTAINS NUMEROUS PHOTOS OF THE WHOLE RESTORATION PROCESS. THE 569CC, FOUR-CYLINDER, SIDE VALVE MOTOR PRODUCED A MODEST 13BHP BUT AS THE TOPOLINO WEIGHED LITTLE MORE THAN HALF A TON IT COULD NEVERTHELESS MANAGE A RESPECTABLE 50MPH-PLUS UNDER FAVOURABLE CONDITIONS. FOR MOST BUYERS THOUGH, THE (UP-TO-50MPG) FUEL CONSUMPTION WOULD HAVE BEEN THE MAJOR ATTRACTION. OUR BEAUTIFUL LITTLE FIAT IS FINISHED IN A FABULOUS COMBINATION OF TWO-TONE GREY WITH BROWN LEATHER SEATS. IT IS AN ENJOYABLE DAILY DRIVER THAT WORKS ON THE BUTTON, HAVING ONLY COMPLETED 1,560 MILES SINCE RESTORATION. THE FEELING WHILE DRIVING IS MAYBE ONLY UNDERSTOOD BY A TRUE ENTHUSIAST. DESPITE ITS SMALL SIZE AND LOW POWER THE TOPOLINO GIVES A FEELING OF FREEDOM, WHICH IS FURTHER ENHANCED BY THE FULL OPEN ROOF. PERFECT FOR THE LONG SUMMER, THIS IS A WONDERFUL CAR TO BE AROUND AND IS SURE TO ATTRACT LOTS OF ADMIRING ATTENTION. FOR THE FANS OF THE FAMOUS MILLE MIGLIA: THE CAR IS ELIGIBLE FOR THIS GREAT ITALIAN EVENT AND THE CHEAPEST POSSIBILITY TO TAKE PART!